The United States Mint has provided the release dates for three new products featuring America the Beautiful Quarters. The three collector sets were previously announced in May, at which time the release dates were unknown. The America the Beautiful Quarters program highlights a National Park or other national site from each state, U.S. territory, and the District of Columbia depicted on the reverse design of a quarter dollar. Five different designs are scheduled to be released each year from 2010 to 2020, with a final design released in 2021. In addition to various collector offerings from the United States Mint, the coins are also released into general circulation, although their appearance has been elusive. 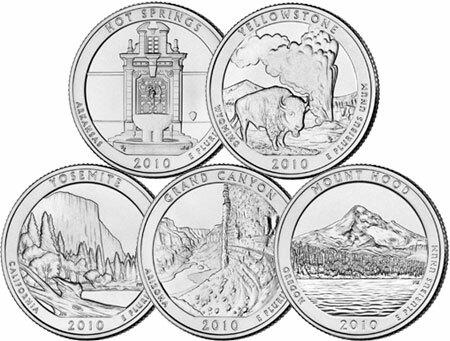 On November 17, 2010, the America the Beautiful Quarters Three Coin Set featuring the Hot Spring Quarter will be released. The set includes two uncirculated coins from the Philadelphia and Denver Mints along with a proof coin struck at the San Francisco Mint. The three coins are mounted on a durable plastic card with site and coin design descriptions. Issue price will be $13.95 with separate sets will be released for the remaining 2010 quarters next year. The 2010 America the Beautiful Quarters Circulating Coin Set will be released on November 19. The set includes circulating quality examples of each of this year’s quarters struck at the Philadelphia and Denver Mints. The ten coin sets are priced at $9.95 and packaged to allow the coins to be easily removed for placement into other albums. On November 23, the US Mint will release the 2010 America the Beautiful Quarters Uncirculated Coin Set. This set features uncirculated quality examples of each of this year’s quarters from the Philadelphia and Denver mint facilities. Th same quality coins are currently available in the 2010 Uncirculated Mint Set. The ten coin sets are priced at $21.95 each.